The Spring Gin Festival logo. A gin festival is to be held in Sleaford next month in what is believed to be a first for the town. The Spring Gin Festival is to be staged by the Rotary Club of Sleaford at the Sleaford Cricket Club on Saturday, March 10, from 2-11pm. More than 30 different artisan blends of gin will be available, accompanied by a choice from a premium range of tonics and mixers. Refreshments will be available and entertainment will be provided by the local, well-known female vocalist Sharna. The entry fee of £10 will include a commemorative balloon glass for the first free drink. Businesses are being encouraged to sponsor a particular gin or to advertise in the festival programme with all profits going to Rotary charities. 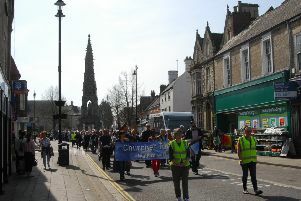 Further details can be obtained from littlemissquick@hotmail.com and on the club’s website www.sleafordrotary.co.uk. Tickets can be purchased through the website, but also from Ray Butler Ltd, Sleaford, and the Shoulder of Mutton, Ruskington.